Join us for A Knight to Remember! This is the Kings Athletic Booster Club's annual fundraiser which benefits over 90 Kings athletic teams, grades seven through twelve! This is your exclusive invitation for this year's event! 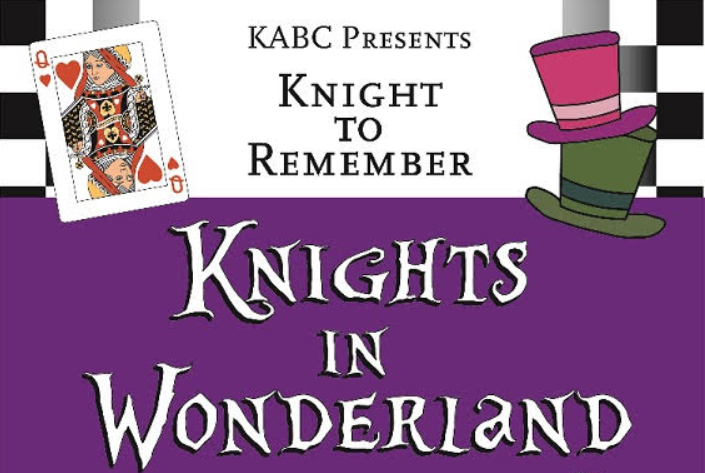 KABC is proud to present, "A Knight to Remember: Knights in Wonderland" on Saturday, March 9 from 5:30 to 11:30 p.m. at the Cincinnati Marriott Northeast, Mason. The Early Bird ticket price of $65.00 will increase to $70.00 after Sunday, February 17th! Our always-popular Happy Hour will be from 5:30 to 6:30 p.m., followed by a seated dinner and live auction at 6:45 p.m.! Back by popular demand, live entertainment will be provided by Kings' own, Strange Love! KTR will feature a wide variety of basket raffles from local partners, silent and live auction, sports memorabilia, and more! Like last year, our registration system will allow you to bid on items directly from your phone the night of the event and expedite your check out process!! To register for the online bidding, click HERE! To RSVP and purchase tickets through KABC's website, click HERE! You can also mail your check for tickets to: Knight to Remember, c/o Erin Deutsch, 7071 Overton Way, Maineville, OH 45039. For questions or VIP table reservations, please contact Erin Deutsch at erin@springdot.com or Tyler Miller at tmiller@kingslocal.net. Dress is business casual or semi-formal and you must be 21 and over to attend. Come and celebrate our community with the "Knights in Wonderland" and support our student-athletes!